Where does one go to get yelled at by frogs? Why, Frog Holler Forest, of course! Frog Holler Forest is our newest park, a 60-acre forest on the southern part of Vashon Island. Frog Holler is actually the name of the neighborhood where the park is located, named as such for the chorus of tree frogs in the area. Acquired in December 2016 with the help of the Vashon Maury Island Land Trust, we recently celebrated the acquisition and marked the grand opening of the park to the public. Former landowners Sheila and Richard Doane with the Frog Holler Forest sign. The forest had been owned for 30 years by the Doane family. They enrolled the forest in the American Tree Farm system and had conducted multiple thinning harvest to maintain the health of the forest. They allowed neighbors to access the property, and eventually, to develop a network of social trails that are popular for walking and riding horses. There is also a five-acre pasture, which has seen its share of sheep, goats, and horses over the years. 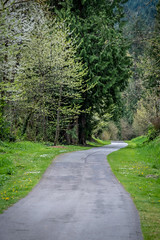 The park was acquired with funding from the voter-approved 2014-2019 King County Parks, Trails and Open Space Replacement Levy, as well as with funding from King County Conservation Futures and the Washington Department of Ecology. In the coming year, we will be working to restore the five-acre pasture, which is inundated by invasive Scot’s Broom. We’ll be developing a long-term forest stewardship plan for the site that will cover improving trails and creating a parking area. Local resident and equestrian, Marie Bradley, has been enjoying Frog Holler Forest for years. She’ll be our forest ambassador there, helping us with trail maintenance, restoration and community relations. Don’t miss Frog Holler’s 50-60 year old Douglas fir trees, which are interspersed with the cinnamon color of madrone trees. The forest understory is packed with very large and healthy evergreen huckleberry shrubs. Makes for a lovely walk in the woods! We’ll be working in the short term to improve access to the park. For now, Frog Holler Forest is open to the public and located east of Wax Orchard Road, between Camp Sealth Road and Bates Walk. For the time being, park along Wax Orchard Road, as there is no dedicated parking lot for the park. Next Post It’s Bike Everywhere Month! Love the park! Can you develop a real map for it that can be downloaded? GPS enabled would be great! Thanks! We’ve got a long list of backcountry trails maps we’re working on – hoping to have something for Frog Holler by the end of the year. Stay tuned!